Modding is a great way to customize your experience in the game, and mods allow players to inject their own creativity into their open Minecraft worlds. One of the great things about Minecraft modding is that anyone and everyone can add their own spin on things. You have the ability to create your own mods, share them with the community, and gain notoriety for creating some cool in-game ideas! Additionally, you can also download, install, and remix other player-made mods, creating a constant evolution of the ways to play the game. So, How Do You Download & Install Mods in Minecraft? Unless your writing unique code from scratch and building your own mod, the best way to start to experience this world of customization is to download other players already-created mods. After downloading, you can then easily install them into your game and begin using them immediately! Follow the instructions below. Thousands of people from around the world are sharing their mods every day. To download a Minecraft mod, go to a trusted site like MinecraftMods or your LearnToMod account, browse the list of user-created mods, and click on one that you find interesting. You can read its description to find out more, then click the Code or Download button, and add a copy of it in your own LearnToMod account. Make a backup file of your Minecraft world. It’s important to save your existing world in case the something goes wrong with the new mod. This will allow you to have access to your original folder and preserve your original game, settings, and creation. Download Minecraft Forge. This third-party tool will help with easily adding mods to your different Minecraft worlds. Next time you launch the game, you should have a new profile entitled Forge. Logging into this will provide access to a new menu option called Mods, where you can apply them to your new gameplay. Download compatible mods. Make sure you have your newly downloaded add-ons ready to be accessed. We will need to move these to a new folder for complete installation. Install mods by copying the files into the /mods/ folder. 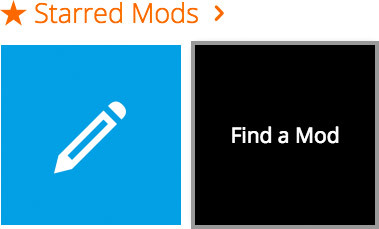 Select your mods and run them. Once you run your mods, you will see them applied directly to your game! Test the mod to see what it does, and compare that to what it is supposed to do. Design one addition to the code and figure out where it should go (for example, in its own function or inside another function). As you add code, test, test, test! After you have remixed the mod, share it with everyone else on the LearnToMod site to see how other coders can take it even further.